This is a site I found that used strictly table-less HTML and CSS to position the footer at the bottom of the page even when there’s littile or no content. I tested it in IE6 & 7, Firefox, and Opera and it worked fine in all 4 browsers. This entry was posted in CSS on July 22, 2009 by Mel. The ‘@import’ rule allows users to import style rules from other style sheets. Any @import rules must precede all rule sets in a style sheet. The ‘@import’ keyword must be followed by the URI of the style sheet to include. A string is also allowed; it will be interpreted as if it had url(…) around it. In the absence of any media types, the import is unconditional. Specifying ‘all’ for the medium has the same effect. This entry was posted in CSS on April 26, 2007 by Mel. 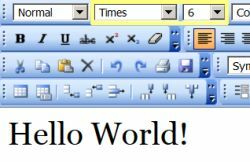 This entry was posted in CSS on April 25, 2007 by Mel.